Traditional braces may be the most well-known method for correcting a smile, but they aren’t your only option. If you want a straighter smile but don’t want to lose the professional image you’ve cultivated, consider Invisalign clear braces from Dr. Khalida Thompson. Invisalign offers a discrete and convenient method for bringing your teeth into alignment, granting you the confident new smile you’ve been dreaming of. 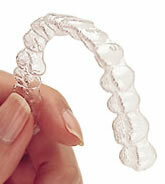 What makes Invisalign such a great option for adult patients? The most obvious benefit is that they’re clear. But more than that, they’re also removable. Made from clear acrylic aligners custom made to fit your teeth, Invisalign clear braces can be removed for eating, brushing and flossing, and special events-whether that be a meeting at work, a family reunion, or some other social event. And because Invisalign clear braces don’t need to be tightened, we only need to see you ever four to six weeks to make sure you’re progressing as expected. If you want to learn more about Invisalign, or if you want to schedule a consultation visit with Dr. Khalida Stutman, just give us a call. Our office is located in North Massapequa and serves patients from New York City, Manhattan, Long Island, Merrick, greater Nassau County, and surrounding areas. by: Dr. Stutman's Office at June 6, 2017 .